To be honest and fair, most of whom you branded as attackers and critics are not really attacking you. They are trying to correct or clarify some of the missing/ misleading info that you have quoted/ stated. Just because they do not see eye to eye on your belief, you said they are attacking you and not being open to new concepts. Have you not attack what they have clarified? Have you yourself remained opened to their explanation and accept that your belief will need more time and studies to prove their real benefits? You have asked others to be objective, but have you done the same? The fact is you did nothing of the things you ask others to do to you. When asked why you are not behaving like what you preach, you gave the lame excuse of wanting to protect what you believe. Nobody is asking you to give up on what you believed in or is passionate about. (Actually, to certain extent, I do admired your love and courage for unorthodox health practices) They are just pointing out the things that you may have missed out or did not consider. In fact, that could be read as them being concern that you may wreck your own (and other's) health, without considering these overlooked factors. Instead you chose to read these comments negatively. The fact that it is always the same 1 against many (and quite a few are qualified medical professionals), it is clear who makes sense and who doesn't. The sad truth is the thread(s) usually started on good quality, but upon your participation, it gets distorted and went haywired. You don't need to rebut or reply to this post. Thanks. Hmmm there's NO essential Carb n NO Carb-Deficiency Disease ! "One day, I came across a website that contained free chapters from the book “Diabetes Solution” by Dr. Richard Bernstein. As a scientist, one idea that I read about particularly struck a chord with me: “the law of small numbers.” Essentially, by minimizing carbohydrate consumption and insulin use, any errors in carbohydrate counting or insulin dosing can be greatly minimized." Now you can see why most of us are so absolutely disgusted with her cult like behavior in the forum and want her banned permanently so that we can have good discussions on health issues w/o her irritating WOTs. This is my blood glucose reading after I cut out animal proteins from my diet. The 7.4 reading was breakfast of 2 slices of white bread and a cup of teh o barely 1 hour ago. Before your breakfast of bread and teh-O, when was your last meal? 8pm last night... 1 vege bao, a bowl of salad and 3 pcs of pumpkin balls... All carbs, zero animal protein. Why don’t you take unsweetened soy milk? It’s a good source of protein. Or is plant based protein also prohibited by your doc? Better go to the polyclinic or your GP to get it checked out. Bro, I'm 50yo. A few years ago I drank soy milk everyday 1 cup for 2 years continuous, all joints in my hands hardened. My doctors and dietitians stopped me in time, took me almost 2 years to recover. So no soy milk in my diet. It's not just the macros and their source that he has to watch. Soy milk (or legumes in general) is high in phosphate and potassium. These 2 electrolytes need to be carefully balanced in advanced CKD. I guess your diet need to readjust and you need a detox period. 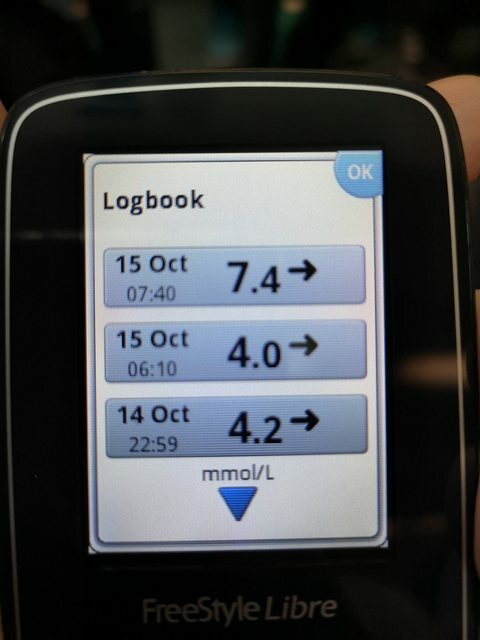 I can meet up with you to understand your diabetic condition and if needed can guide you back on track. Lifestyle changes have to start from you. The last blood work result, Potassium is 5.6 and Phosphate is 1.5. Currently on medication to curb the Phosphate, must swallow the med together with first mouth of food during lunch and dinner. For curbing potassium, just eat veg and fruits low in potassium will do. This one is normal or got diabetes ?